She already has it all figured out. Over at Alex on Film I’ve been watching adaptations of John Wyndham’s classic SF novel The Midwich Cuckoos. The first of these was 1960’s Village of the Damned (they sure weren’t going to stick with Wyndham’s title). 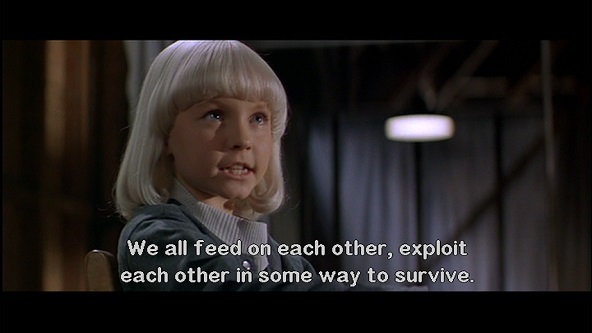 This was followed by the Cold War parable Children of the Damned (1964), a film very different in tone. Then John Carpenter took a turn with an uninspired remake of the original in 1995. I guess the 1960 version is the best of these, and the only one really worth watching. None of the movies, however, really digs into the main theme of Wyndham’s book, which has to do with a battle for survival between incompatible species.